It’s the heart of the MLS season, and the All-Star break gives us all a chance to catch our breath before a wild stretch run. Once the break is over, though, the Union are right back at it with one of the most challenging eight-day stretches of the season. Those eight days will sandwich two MLS matches — a trip to one of the league’s best teams and atmospheres and a trip to one of the Union’s closest rivals for the playoffs — around the U.S. Open Cup semifinal, a chance for the club to move within one match of its first-ever trophy (non-2015 IMG Suncoast Pro Soccer Classic category). It’s an excellent opportunity for the Union to demonstrate their quality. It could also, of course, be a trap. Off the pitch, after all, the Union are entering this week with their sporting director leaving the club, and there are no indications that he will be replaced immediately or that the team will make any summer signings. Let’s put that off-pitch worry to the side for the moment, though, and focus on the matches at hand. Here’s some thoughts on how Philadelphia should tackle this trilogy of games. Starting off the three-game stretch with the least essential contest isn’t ideal. If you were Jim Curtin, you’d want to start with the Open Cup match, so you could set up your best possible lineup after a ten-day break. Instead, the Union have to fly out to Portland first, making a cross-country jaunt for a game late Saturday night against a squad that hasn’t lost a match since April 8. It’s my understanding that the Union will use one of their limited charter flights this season for the Portland game. (Restrictions on charter flights for MLS teams come from the league, not from each team’s individual budgets, so this isn’t a question of the Union being cheap.) That should mitigate some of the travel unpleasantness. But the question of team selection is big, too. Curtin is not a believer in squad rotation for the sake of squad rotation, but he’s shown a willingness to make minor changes as necessary to line the team up for a bigger game. Auston Trusty and Mark McKenzie have played almost every minute at the back for months now — in fact, Trusty has played literally every minute this season. Both are also in Atlanta for the MLS Homegrown Game through at least late Tuesday night. And both are in their first professional season. Curtin should think about bringing Jack Elliott and Richie Marquez in at center back for the Portland match. It gives the two starters a chance to breathe and hopefully fend off the “rookie wall” as long as possible. The opposition to this move would be that it’s simply conceding the match to Portland. Is it? Union brass have bragged this year about their depth compared to years past. If that depth actually exists, it means that you should be able to use an accomplished MLS veteran and a young player coming off a Rookie of the Year-caliber campaign in a spot start and not look like a Casa League side. 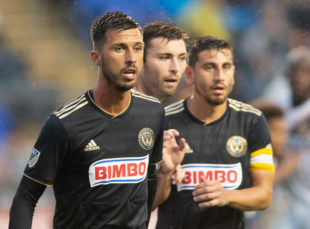 A draw on the road against one of the league’s best teams wouldn’t be a bad result — and it wouldn’t be the first time the Union haven’t aimed for all three points. But, like most cliches, there’s a lot of truth in there. With just four teams left, the Union have a decent shot of coming out on top of this year’s cup. The Union aren’t the favorites, of course. LAFC are by far the best team left in the competition, and with the Union set to travel for the final they’ll be big underdogs if they have to go to Banc of California Stadium. But the other two teams shouldn’t scare the Union. Philly has had Chicago Fire’s number in their two matches this year, first a 3-1 win at home in late May followed by the insane 4-3 victory at Toyota Park in mid-July. And they toppled Houston Dynamo on the road just last Wednesday. There’s no real excuse for fielding anything less than a full-strength lineup next Wednesday. Curtin taking the Open Cup seriously has helped the team achieve quite a bit of success over the years, especially compared to their MLS form. A rowdy crowd at Talen would help, too. Though wild weather and memorable matches have made their mark on the Open Cup in Chester over the years, this year’s edition has been relatively tame. Maybe that comes to an end on Wednesday. Capping this wild week is a trip up I-95 to Foxborough to Gillette Stadium to take on the New England Patriots Revolution. Under first-year manager Brad Friedel, the Revs have been a bit of a surprise, heading into the week one point ahead of Philadelphia with the same number of games played. This match begins a six-match stretch where the Union take on six conference opponents, including three huge six-pointers against the Revs or Impact. (Writing “six” three times in that sentence makes me uncomfortable, but we must press on.) At the end of it, the Union will have finished their season series against both clubs, and will be unable to influence either team’s fate. The first step in this crucial stretch toward securing that elusive playoff birth is with a win in New England next weekend. The opportunity is before the Union. Will they seize it? Seems like every win puts us in a playoff scenario, but then it’s followed by floundering. Nice to have perspective on this all. Portland should without a doubt be a backups game. Get Elliot, Marquez, Jones, Creavalle, Epps, Fontana and others out there. Don’t even take some players so they don’t have to worry about the flight. If Curtin doesn’t start a B type squad against Portland, after consistently talking about how important the Open Cup is for years, he’s a hypocrite and a complete idiot. Some may argue he’s an idiot regardless, but I digress. Point is… just go for the Cup win and worry about anything else after that. SPORTING DIRECTOR?????????????????? DOES ANYONE CARE ABOUT THIS??????????????? Today is T minus 1 day, the day Earnie starts his job at USMNT, Aug 1st. Has any news come forth about the Union’s next GM, or SD? Of course not… and if Jay names Chris Albright as GM or SD, we all know he’s the cheap skate we all knew he was. BOYCOT GAMES… THIS IS RIDICULOUS. THAT MLS ALLOWS THIS TYPE MANAGEMENT/OWNERSHIP IS JUST UNBELIEVABLE. No idea who yet, but they have someone in place. So let’s wait on details before burning the place down. Chris Albright has not yet agreed to his new parking space.